John is sharing a part of Jesus’ story concerning Lazarus, Martha and Mary. Lazarus has died, and his sisters Martha and Mary are distraught. Jesus arrives several days later when Lazarus is already in the tomb. Martha greets Jesus and notes that Lazarus would not have died if Jesus was present. She had seen enough of Jesus’ healings to know Jesus could have healed Lazarus. But, Jesus in this moment wants to demonstrate that he not only heals but he gives life. As is typical of a Jesus healing, it comes with a lesson. He tells Martha that Lazarus will rise and she thinks Jesus is talking about the resurrection on the last days, the final days of the world in which all will rise and be judged. But Jesus tells her I am the resurrection and life, whoever believes in me never dies. Martha sounds like she understands but this is really new news to her. It is one thing to die and rise in the final days, it is something else to never die. 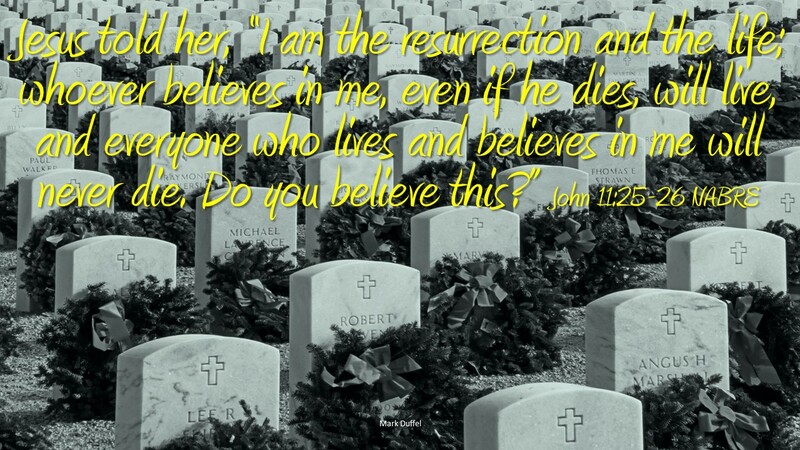 So when Jesus asks Martha if she believes, she express her faith in Him. She says I believe you are the Messiah, the Son of God. Martha’s faith is strong but it is still not mature. Jesus then has Lazarus walk out of the tomb alive and all are amazed. Jesus creates in us a new life, for those who believe and accept Jesus. The common way to receive this new life is through Baptism, but accepting Jesus can take other forms. We are conceived by our parents and God, and we have nothing to say about it. But new life is given as a gift from Christ, and we have everything to say about it. This life is in Jesus followers, in you. Do you believe? Do you live as if your life is eternal?